COMMON EIDER DUCKLINGS AT CAPTAIN JOES! You never know what wonderful glimpses of wild life you may encounter at Captain Joe and Sons. Sunday morning during the podcast, a crèche of fourteen Common Eider ducklings and their mother hens were spotted, bobbing in the waves and foraging at the edge of the dock. Common Eider Moms, along with non-breeding “aunties,” band together for protection. The individual broods come together to form a crèche, which may include as many as 150 ducklings! 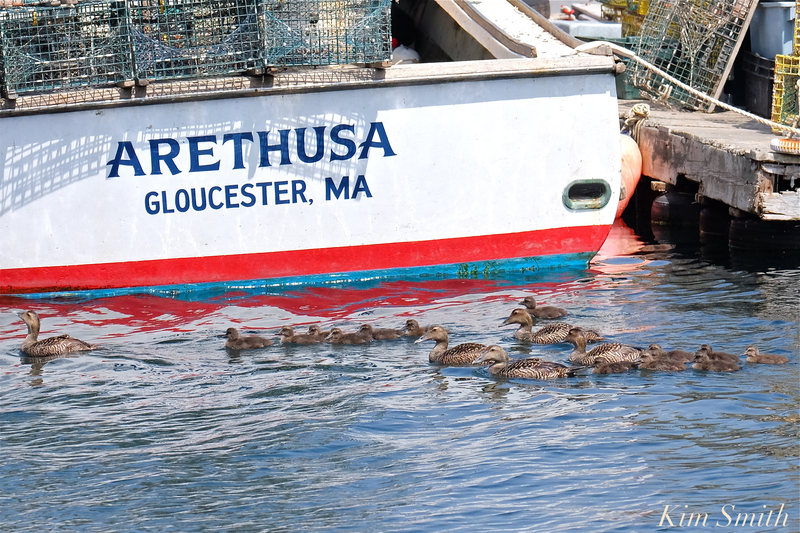 This entry was posted in Birds, Birds of New England, Cape Ann Wildlife, Life at the Edge of the Sea and tagged Beautiful Birds of Cape Ann, Captain Joe and Sons, Common Eider crèche, Common Eider ducklings, Common Eider female, Common Eider hen, Gloucester Lobster Boat, Somateria mollissima, The Arethusa on June 26, 2018 by Kim Smith.